Looking in the mirror, Jay* was becoming increasingly worried about the state of his hair. Patches of scalp showed through between his long, shaggy locks and his heart sank knowing he would lose it all. Father, Uncles, Grandfather. It was inevitable that Jay would follow in their footsteps and go bald if he did not do something about it soon. He had been seriously considering finding a hair loss treatment for two years when he saw an ad for Ashley and Martin on the television. Picking up the phone, he took the first step towards treating his hair. A scalp examination revealed that Jay’s hair had been shedding at an accelerated rate for six years, leading to a Norwood III vertex loss with thinning especially evident throughout the vertex area. Asking what Jay was hoping to achieve from treatment, the consultant found that his goals were to simply save and thicken the hair he had left. Confident that treatment with a RealGROWTH® medical hair regrowth program could achieve exactly what Jay was looking for, the consultant laid out the process in which his hair would be treated and invited Jay to ask any questions he had. The only thing Jay was unsure of was if he wanted to pay upfront or in easy monthly instalments, so he went home to discuss it with his partner. He knew she was not worried about him losing his hair but was fully in support of him treating it as she knew how much it worried him. Once the couple had made their decision, Jay called the clinic and commenced his treatment. His treatment was easy to complete at home and while he did not attend regular laser therapy appointments as advised, Jay still gained great benefits from the treatment he was completing regularly. 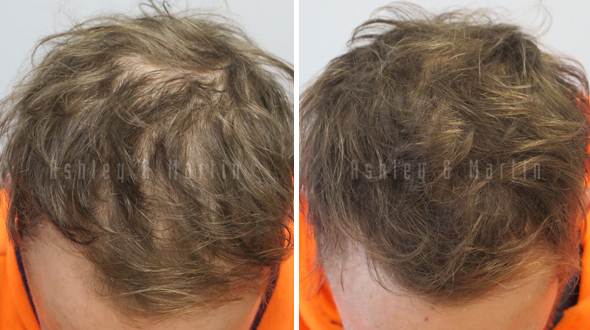 With the use of the RealGROWTH® solution and oral medication prescribed by the clinic hair loss doctor and a herbal supplement, Jay’s hair fall returned to a healthy rate. Dormant hair follicles re-entered their growth phase and miniaturised hairs became thicker and healthier. Jay’s partner noticed his hair returning and he was ecstatic that he had gotten everything he had hoped for in coming to Ashley and Martin.